Hungarian Legislation Threatens American University In Budapest : The Two-Way Central European University is widely considered Hungary's top private university. It was founded by financier George Soros, who has a strained relationship with Hungarian Prime Minister Viktor Orban. 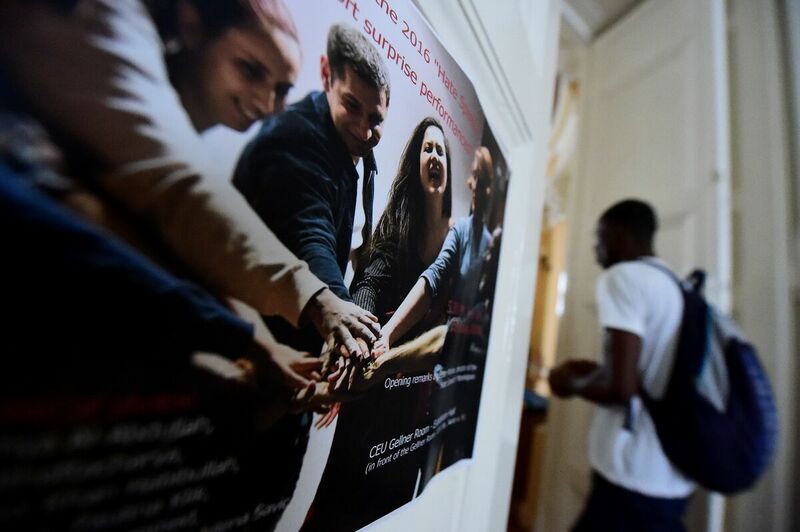 A student arrives at the Central European University in Budapest on the first day of classes in September 2016. The right-wing government of Hungarian Prime Minister Viktor Orban is taking steps that could cause a popular American university in Budapest to close. Under a bill submitted to the Hungarian Parliament late Tuesday, non-EU universities issuing diplomas in Hungary would be required to have a campus in their home country. Central European University — which was founded in 1991 by liberal philanthropist and investor George Soros and is widely considered to be the top private university in Hungary — does not have a campus in the United States, even though it is registered in New York state. Students from scores of countries are enrolled in the university's English-language, graduate and post-graduate programs. Orban and the Hungarian-born Soros have a strained relationship, even though the prime minister received a scholarship from the Soros foundation that allowed him to study briefly at Oxford. Hungarian officials say the legislation doesn't have anything to do with Soros or CEU, even though the new requirement doesn't affect Hungary's 27 other non-EU universities, which all have campuses abroad. They say the changes are needed because foreign-funded universities are operating outside the law. But many Hungarians, and certainly Orban's critics in and outside of the country, believe the legislation is a clear attempt to shut down CEU. If the legislation passes, the law would take effect in September and CEU would have to open a campus in the United States by Feb. 15, 2018, if it wants to stay open. That is something the university says "would have no educational benefit and would incur needless financial and human resource costs." The bill "is a threat to our continued existence in Hungary," Michael Ignatieff, CEU's president and rector, told reporters at a news conference. He vowed to fight back, adding: "This university is not going to close under any circumstance and we won't be pushed around." Ignatieff met with Hungary's education minister Wednesday night in Budapest to try to resolve the conflict, CEU spokeswoman Colleen Sharkey told NPR. She said Ignatieff described the meeting as "icy cool" and that it left him "confused." "CEU represents the best set of values that have really helped to open democratic space in central Europe," he told NPR. "It's clear that scholars, students and those who are committed to the expansion of civil society space will continue to defend those values even in the face of this repressive legislation." Orban has pledged to turn Hungary into an "illiberal state" and is a staunch supporter of President Trump. Gaspard said it was "difficult to speculate" whether the Hungarian leader was counting on President Trump not to intervene because Trump and Soros also don't get along. "But it's clear that there is a trend to closing off civil society space in a number of capitals around the world," Gaspard said. Education Ministry State Secretary Laszlo Palkovics earlier told a news conference: "If the current [U.S.] administration supports it, then so will we." The U.S. Embassy in Budapest criticized the Hungarian action. Reuters reported Charge d'Affaires David Kostelancik saying in a statement that CEU "enjoys strong bipartisan support in the U.S. government."